From the early years of this relationship, “Great and Good Friend” was a salutation used by U.S. presidents in addressing the kings of Siam. This formal greeting harks back to a time when contact between the two governments was limited to envoys and letters, a reminder of how much the relationship has advanced over the past 200 years. “View of the City of Bangkok,” 1822 Illustration by H. A. C.
“ทัศนียภาพของเมืองบางกอก” พ.ศ. 2365 ภาพเขียนฝีมือของเอช. เอ. ซี. Four decades after declaring independence from the British Empire in 1776, American merchants were looking to increase trade beyond the Atlantic Ocean, Siam was strategizing against encroaching European imperialism in Southeast Asia. Although cultural differences and geographical distances divided them, both Siam and the United States saw a friend in each other. Initial contact was made in 1818, when an American expedition to Siam established the earliest treaty between the United States and an Asian nation, initiating a “perpetual peace” which has lasted to this day. When the countries were still separated by months at sea, Siam’s participation in several American world’s fairs brought the kingdom to the republic’s doorstep. 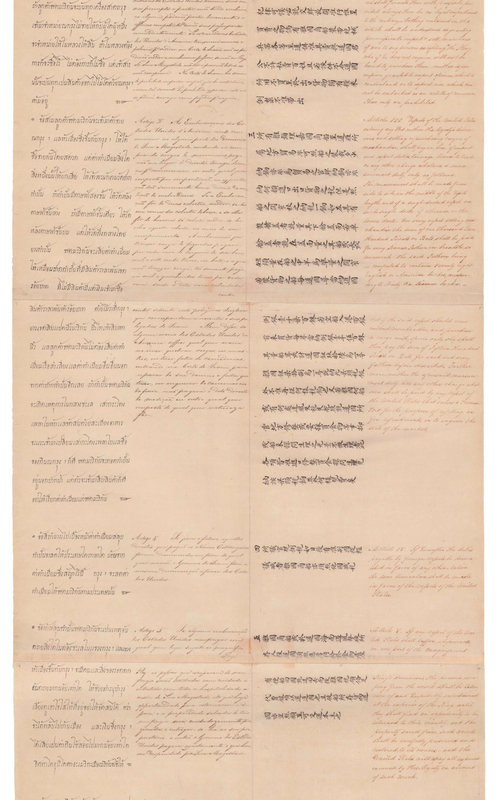 This letter from Dit Bunnag (1768-1855) to President James Monroe (1758-1831) represents the earliest known correspondence between the governments of Siam and the United States. 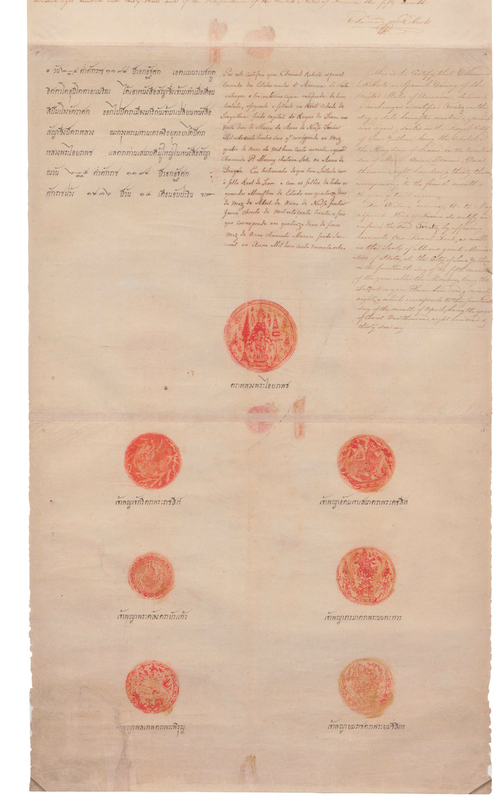 It is signed by “Phaja Surivongmontri,” referring to Somdet Chao Phraya Dit Bunnag, one of the most influential noblemen in Siam during the nineteenth century. Dit Bunnag’s letter recounts a meeting between Prince Chetsadabodin (later King Nangklao, or Rama III, 1788-1851) and Stephen Williams (1781-1844), an American sea captain who had arrived in Bangkok to trade for sugar. Williams helped to initiate one of the United States’ oldest relationships in the Eastern Hemisphere. 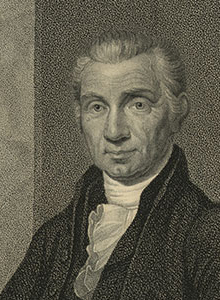 Edmund Roberts (1784-1836), an agent of the United States, was tasked with visiting the major empires and kingdoms of Asia to seek trade agreements on behalf of the United States, the first diplomatic mission of its kind for the young nation. Roberts and the crew of the USS Peacock arrived in the Gulf of Siam in February 1833, nearly one year after departing from Boston, Massachusetts. Bangkok had been the Siamese capital for only half a century when the Roberts expedition arrived, yet it had quickly developed into a bustling hub for trade. 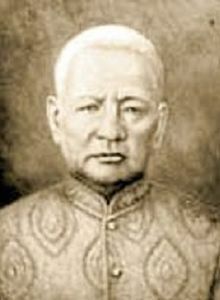 During their stay, Roberts met primarily with Dit Bunnag, who was at this point the phrakhlang (minister of foreign affairs and finance) and thus responsible for the negotiation of treaties. Three years after it was initially drafted, the Treaty of Amity and Commerce, the first agreement of its kind between the United States and an Asian nation, was fully ratified by King Nangklao, the U.S. Congress, and President Martin Van Buren (1782-1862). The primary objective of this agreement was to establish a system of duties to regulate the import and export of goods by American merchants, thereby promoting trade. The treaty’s success was limited by the geographical distance that separated both nations, but still represented an important step for the United States and Siam in their development as world powers. Inspired by a discussion King Mongkut had with an American captain about how elephants would be perceived in the United States, the king wrote to President Buchanan offering the United States a pair of elephants to “increase and multiply in the continent of America.” Along with his letter, the king included a pair of elephant tusks “the glory and renown of Siam may be promoted. By the time the letter reached Washington, D.C., Abraham Lincoln (1809-1865) was president of the United States, and the country had descended into civil war. In 1862, President Lincoln politely declined the king’s kind offer out of concern that the U.S. climate would not “favor the multiplication of the elephant,” though it is also possible that the ongoing conflict at home contributed to the decision. Although the elephants never made the voyage around the world, the generosity of King Mongkut’s offer and the graciousness of President Lincoln’s reply nonetheless underscore the friendly spirit between both nations. World expositions, commonly known in the United States as world’s fairs, were a popular means by which Americans learned about other cultures in the late nineteenth and early twentieth centuries. The Kingdom of Siam participated in several famous expositions celebrating significant occasions in American history, including the U.S. Centennial (Philadelphia, 1876), the 400th anniversary of the arrival of Christopher Columbus to America (Chicago, 1893), the centennial of the Louisiana Purchase (St. Louis, 1904), and the completion of the Panama Canal (San Francisco, 1915). The royal family took an active interest in curating these displays. 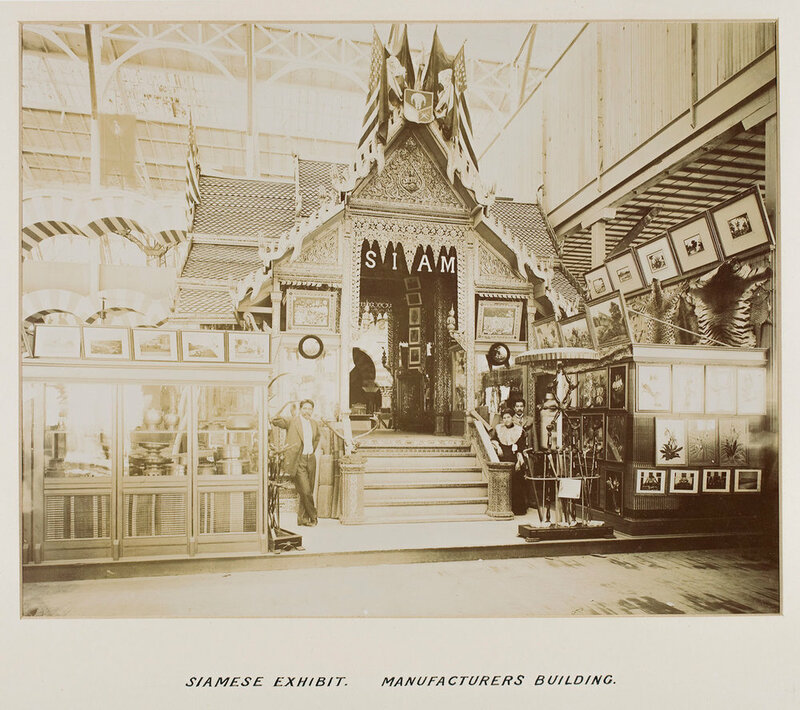 For the 1904 and 1915 expositions, large-scale model temples were commissioned to serve as exhibition space, briefly transporting visitors to the Buddhist kingdom. While beautifully ornamented niello and lacquer objects demonstrated the skill of Thai artisans, everyday objects such as baskets, fish traps, and tools were also exhibited, conveying a sense of daily life. In 1931, King Prajadhipok (Rama VII, 1893-1941) and Queen Rambhai Barni (1904-1984) became the first reigning monarchs of Siam to visit the United States. Though the royal couple had traveled to New York in 1924 as prince and princess, it was their second visit that marked a historic milestone. The king and queen received a royal welcome in New York City, where they stood atop the newly completed Empire State Building, then the tallest building in the world. They also met Babe Ruth, one of the greatest baseball players in history, and famous American pilot Amelia Earhart, while attending a New York Yankees baseball game. His Majesty’s sentiments towards the United States endeared him to the American public, who were eager to learn more about the Kingdom of Siam. The visit was covered by several newspapers, including the nationally syndicated TIME magazine, bringing the Kingdom of Siam into homes across America. King Bhumibol Adulyadej addresses the 86th U.S. Congress, 1960 Washington, D.C.
King Bhumibol Adulyadej and President Dwight D. Eisenhower with His Majesty’s gift of a teak elephant, 1960 Washington, D.C. Photograph by Abbie Rowe Courtesy of the Dwight D. Eisenhower Presidential Library and Museum. 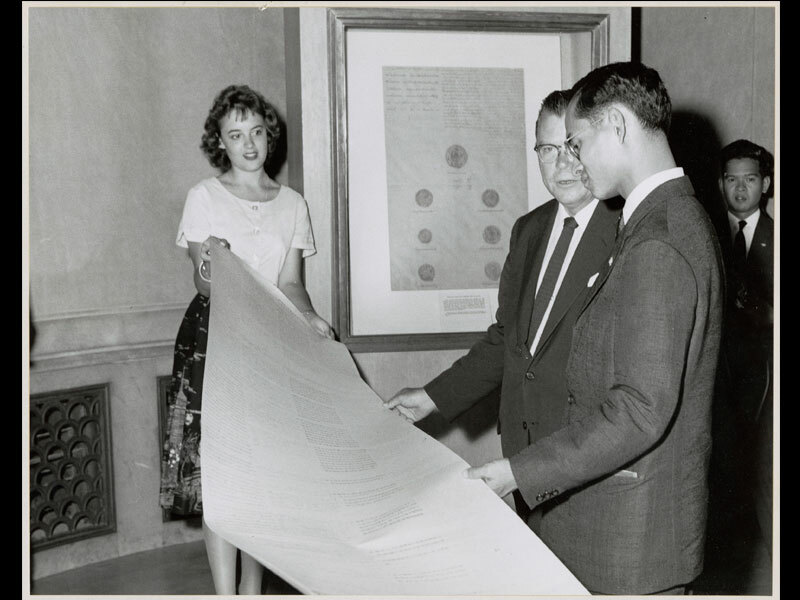 In 1960, King Bhumibol Adulyadej returned to the United States on the first of two state tours. The royal family spent a month in the United States visiting many places in California, Colorado, Hawaii, Massachusetts, New York, Pennsylvania, Tennessee, Virginia, and Washington, D.C. The American public was fascinated with the young royal family, and newspapers headlined their travels throughout the nation. The highlights of their itinerary included a reception by President Dwight D. Eisenhower (1890-1969), a tour of Disneyland with Walt Disney, and musical collaborations with famous American jazz artists.